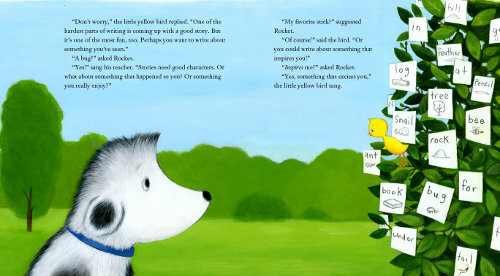 This is the first time Tad Hills’ Rocket, pictured above, has visited 7-Imp, and it’s long overdue. 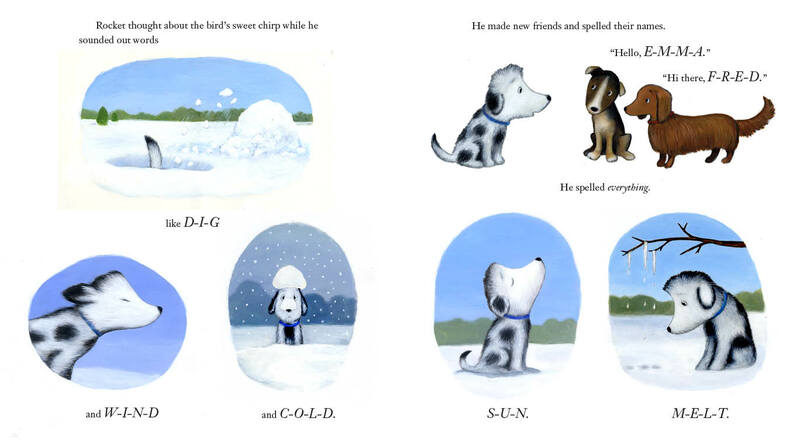 So, when I write weekly columns for Kirkus, I always follow up one week later here at 7-Imp with art from the book. (To not post as much art as I’m allowed makes me twitch a little.) 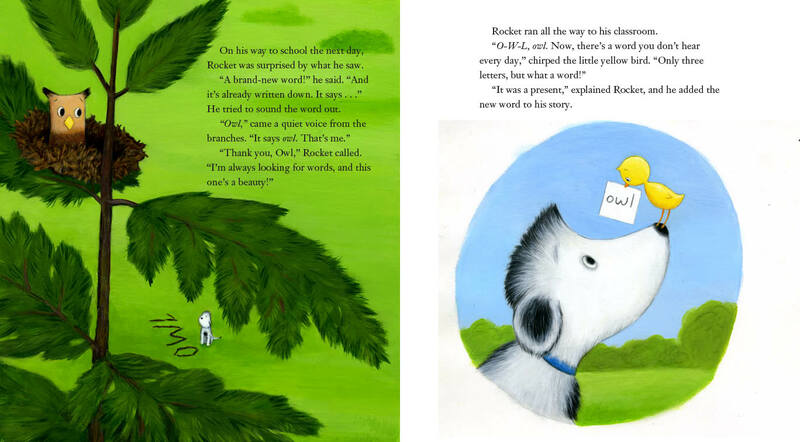 In early May, I did a short Q & A over at Kirkus with author/illustrator Tad Hills. 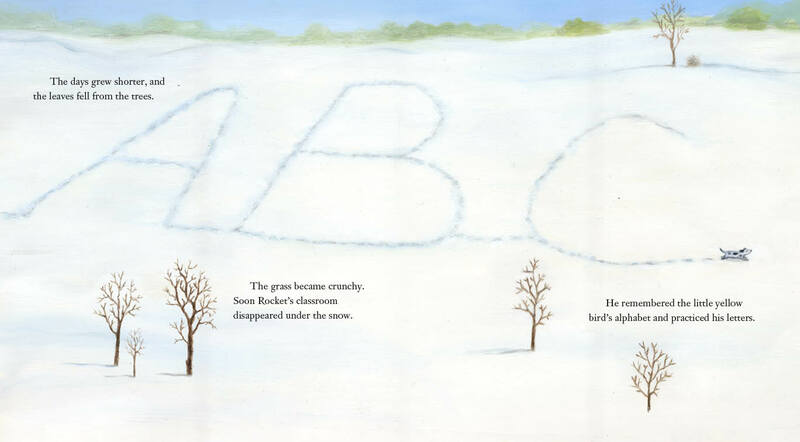 He has created many picture books over the years that my children and I have enjoyed, including the Duck & Goose books, one of which I covered here at 7-Imp in 2007 (back when, shudder, I only included book covers). 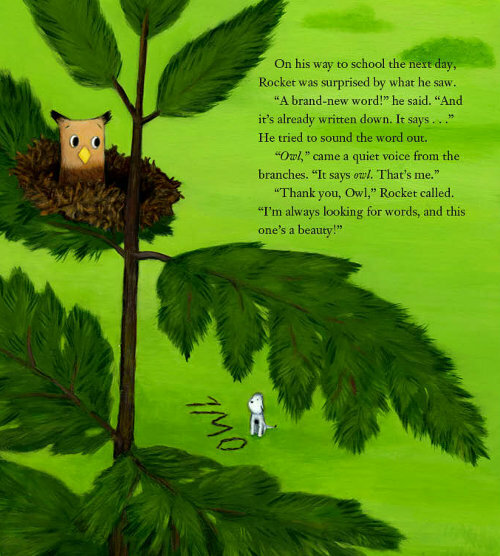 When I chatted with Tad in May, we talked about his new Rocket book, Rocket Writes a Story, to be released by Schwartz & Wade this week. 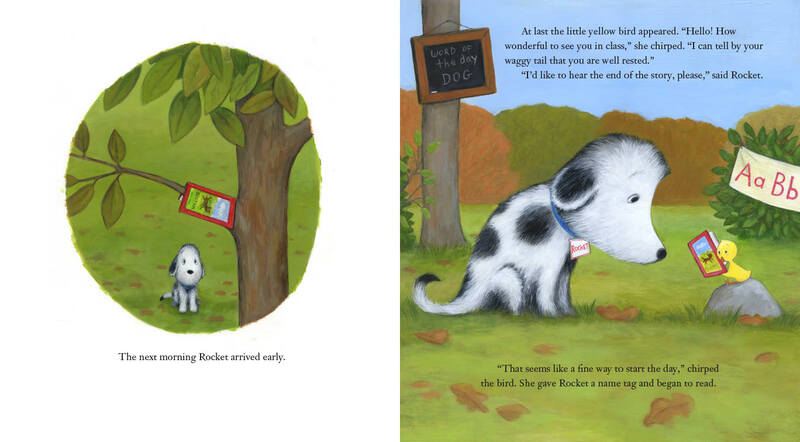 This book is the follow-up to How Rocket Learned to Read, which was a 2010 title. 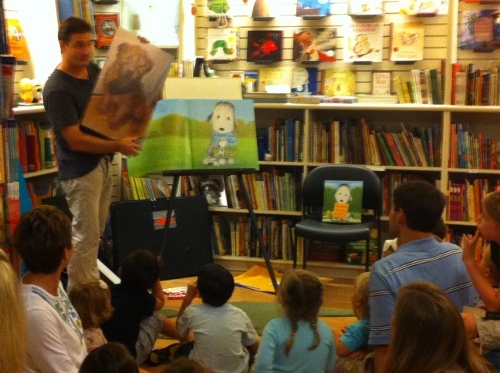 I considered it a 7-Imp 2010 travesty that I didn’t cover that book here. I wanted to. I liked it. But what can I say? Some books fall through the cracks, and that book fell through the cracks in 2010. And then what did I do this year? I completely blanked on my follow-up 7-Imp post to the Kirkus Q & A I did with Tad in May. I was sitting on the art you see here today (which includes art from the 2010 title), but I realized the other evening that I never posted it. Gasp. This is not like me. Not at all. The best explanation I can come up with is that the week I had planned to post it was the same week Sendak died, and I was rather stunned and sad — and it just all threw me, I think, and clearly left me flum-diddly-iddled. But all’s well that ends well, ’cause the book is being released this week after all. So, see? I TOTALLY MEANT TO DO THAT. 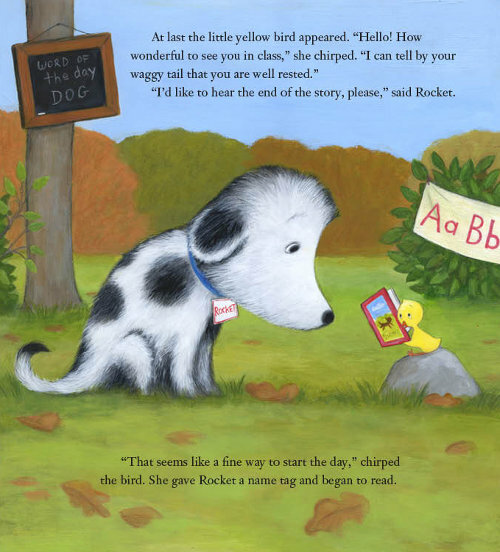 Rocket’s reluctant to learn at first—he loves to play, chase leaves, chew sticks, and listen to the birds sing, so what else does he need anyway?—but the bird begins reading a story aloud one day, a story about a dog named Buster, and Rocket is hooked. 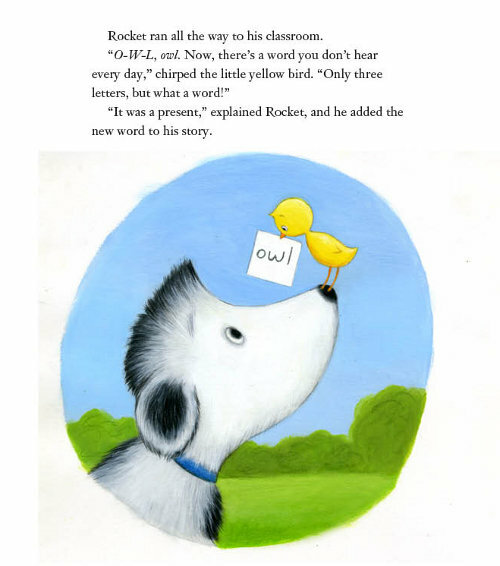 Reading is taught a myriad ways in schools today, but I like this way best of all: Wanting to hear the end of a juicy-good tale is what compels Rocket to learn his letters. “Don’t forget! Words are built one letter at a time!” the bird tells him. 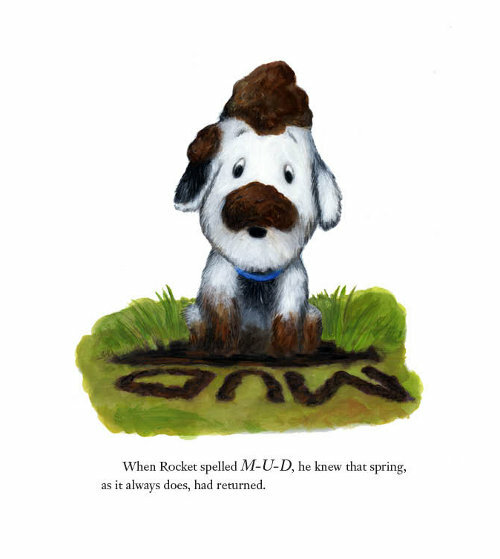 In the follow-up we’ll see this week, Rocket Writes a Story—rendered in oil paints and colored pencil—we see that Rocket is still reading, and he even likes to go out searching for new words. He writes them down and hangs them in the tree. “Now what shall we do with these splendid words?” the little yellow bird says. “I’m going to write a story!” Rocket declares, an adventure story. Because stories connect us with others. I wonder what Rocket’s gonna do next. Perhaps we’ll get to witness the writing of his dissertation one day. I have no doubt Tad Hills could make it interesting and endearing. ROCKET WRITES A STORY. Copyright © 2012 by Tad Hills. Published by Schwartz & Wade Books, New York. All illustrations reproduced with permission of the publisher. 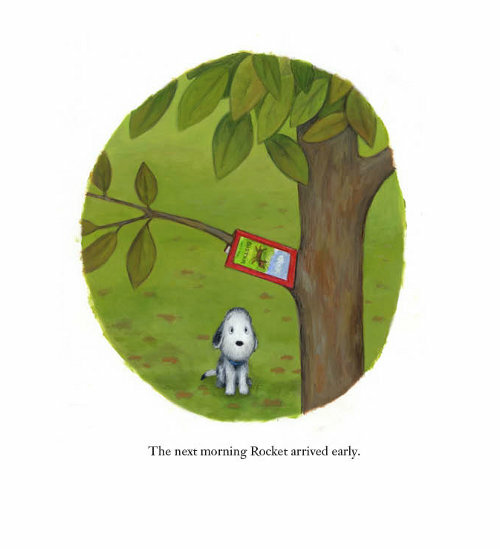 HOW ROCKET LEARNED TO READ. Copyright © 2010 by Tad Hills. Published by Schwartz & Wade Books, New York. All illustrations reproduced with permission of the publisher. 1) See that “then together they began to read” spread above? I love the look on Rocket’s face there. It’s the intently-listening-to-a-great-story face. 4) Corb Lund. Fifth song down here. 6) I got neat, angina-inducing news this week, but more on that later. 7) I spoke on Friday morning on the campus of The University of Tennessee about picture books. That was fun. And, because I had a bit of a drive there and back that involved me and only me, I could listen to my Rufus CDs—I’m exploring all his older ones—very loudly. What? You didn’t think a week would go by without me mentioning him? Sorry. I’m just getting straight-up annoying now, aren’t I? 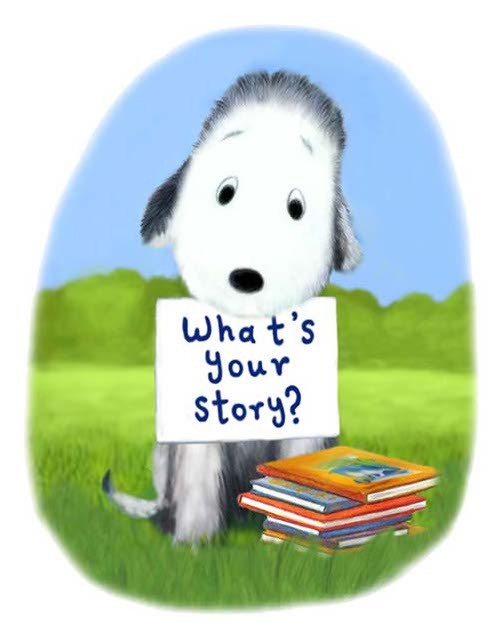 What is YOUR story this week? I’m so glad you got to see Tad Hills- we loved him when we met him. And the new book looks darling..
Ok.. I haven’t kicked in ages. Here goes! 1. A heat wave that finally broke. 2. My new fascination with middle grade novels- Three Times Lucky is my current find. 4. Children happy at play after we declared a total and complete (for now) vacation from tv. 6. A family birthday celebration. 7. A short get-away with just my hubby all planned. Hope all my fellow kickers are doing well. It feels good to be back! Jules, your picture book talk sounds great! I’d love to hear more details, but only if you have time! Stacey, the heat finally broke down here too, although it’s slowly seeping back :/ You Vacation from TV sounds great and good luck with your writing! 1. Finished my 45 page book list of children’s books set in Ancient History, started this project as a resource for my mom and little brother as they take on Ancient History for homeschooling this year! Although now I’m reworking the format, because I realized I could possibly sell it on Amazon which would be really cool! 2. Entered the new, scary (well not really, but it takes getting used to) world of twitter this week. 3. Went on my first run in a while, although now I have to keep up and continue. 5. Finished John Green’s The Fault in our Stars, I rarely do this, but I cried and literally laughed out loud and was beautifully and intellectually inspired. I am going to be racing to the bookstore when this second book hits the shelves because I adored the first one, Jules. And the teaching tools are amazing; tried and true. So happy you and your girls got to see and meet him. Stacy: Welcome to the world of MG novels. 21 of my 34 years as a teacher librarian was at the middle school level. I love those books. Jess: You will love the immediacy of Twitter. I sobbed repeatedly reading The Fault in Our Stars. ALA Graphics has a new poster featuring Rocket. 1. The rain did come for a day which was great. Didn’t have to haul hoses until yesterday. 2. Gardens are edged and weeded. 3. My There is work to be done, but all I want to do is Read poster arrived. 4. My copies of both the Nanny Piggins books autographed by the hilarious Dan Santat came. 5. 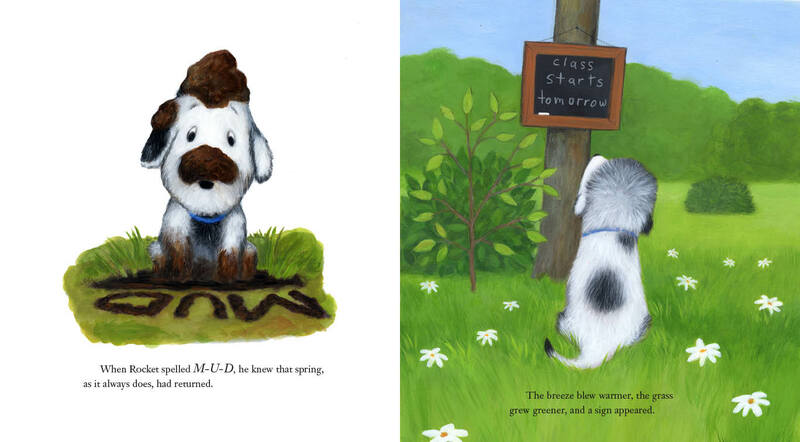 So very happy that two author/illustrators commented about reviews on my blog. It’s nice to know you might be doing something right. 6. Found another heart shaped stone when weeding. Love is where you find it. 7. Saved a toad trapped in my watering can this morning. I love Rocket so much. AND I LOVE THE HIPHOPAPOTAMUS. 2. I went to see Chuck Prophet play, and it was awesome. 3. Read Only and One IVAN. Loved it. 6. Caught up with a friend I hadn’t seen in months. 7. It’s 11:22 on Sunday, and I’m typing this from my bed, where I’m curled up with the kids, watching Sat morning TV. Laaaaazy. Hi, Jules! It seems ages since I last left a comment at 7-Imp. I’m busy these days being a nanny granny. I don’t have as much time for blogging as I once did. I hope you and your family have been well. I’ve gotten some of Tad’s books for my granddaughter. I think I’ll have to add these two “Rocket” books to her already extensive picture book collection. 1. I get most of my kicks from my granddaughter Julia these days. She has taken her first steps and is drinking from a sippy cup now. I so enjoy reading board books to her. She’ll be a year old in a couple of weeks. I can’t believe how the time has flown. 2. I finally finished the final draft of my “Things to Do” manuscript last month. Now I just have to wait to find out who will illustrate the book. 3. I’ve done some major cleaning around my house and thrown tons of stuff that I don’t need away. Things are really getting organized around here. It feels great! Rocket is never on the shelves of my library. So happy there”s a sequel. He’s the cutest dog. Jules, now you have me curious of good new to give you angina. Stacey, yum, local corn and cooler weather. Jes, I agree w/ Margie, you’ll like twitter. Margie, I need that poster. 3. Hearing author Tayari Jomes at the local beach bookstore. 4. Hiking Tillamook Head. Strenuous ascent but worth for the view. 5. Buying books for grnadgirl’s. 7. Fire, s’mores on the beach last night. Elaine, welcome back. Looking forward to reading your new book. Laurel, enjoy the summer rain. Hello, Rocket, Tad, and company. How are you? Three cheers for reading, writing, and sharing! Jules: Hope it’s truly good news and not causing you stress. Jess: Congratulations on completing your booklist. Sounds like a great resource. Margie: Thank you for saving the toad. Yay for the heart-shaped stone. Laurel: That IS a joy, isn’t it? (re: cat cleaning) Been there, done that… and miss them horribly. Please hug your cats for me. Elaine: Congratulations on completing your manuscript. Happy early birthday to your granddaughter. Jone: Sounds like you’ve been seeing a lot of lovely sights! 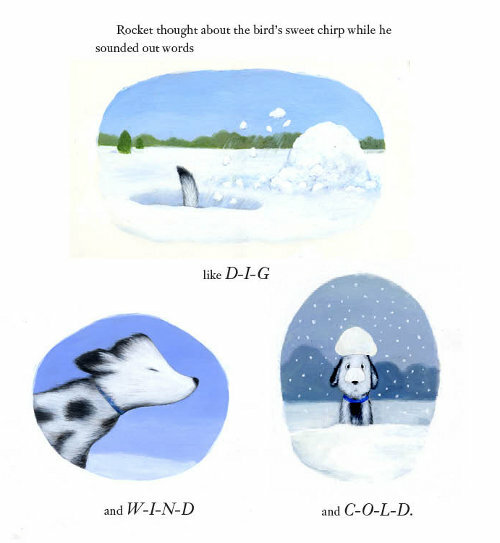 I look forward to reading the Rocket books! I laughed when I read, “I see by your waggy tail that you are well-rested.” I wish humans had furry tails for expression and balance. 3. I found Pimm’s (an infused gin aperitif) and now I can make Pimm’s Cups. I even have borage growing in the yard for garnish. 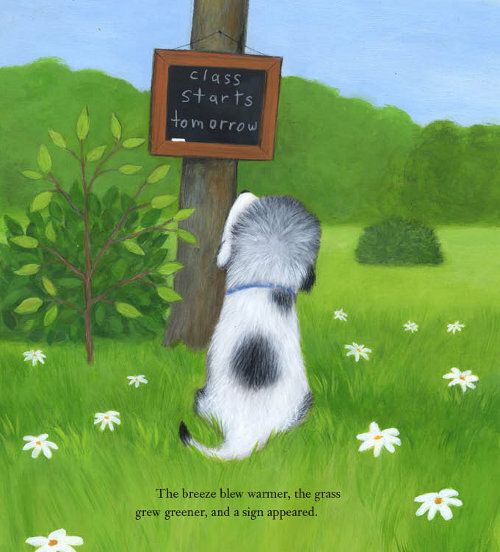 Jules- I’m going to get the audiobook of, “Bossypants” to listen to in the art studio. Margie- My niece found a granite, heart shaped stone as big as her head at the beach. Laurel- Lazy Sundays are the best. 1. My two week visitors went home. The house is so quiet and empty. 2. Frozen mudslides on the porch. 3. My wonderful husband built a trellis for my roses. 4. Stole away enough studio time to sneak a pic. in for Illustration Friday. 5. Fancy dinner by the sea with my sister. 7. I’m gonna steal kick #4 from S&S. Moira: Kick #4 was a good kick to steal! Now, how am I going to steal your kick #6, i.e. lobster mashed potatoes? I’ve never heard of such a delightful concoction. I want some. I need some. In the meantime, I must munch on almonds and an an oatcake. Margie, the toad thanks you, I’m sure. … I’ve got the Nanny Piggins book, too, and am eager to read it to my girls. Laurel, I think your last kick trumps all the other ones, though of course it’s awesome that you turned your book in. Elaine! I’m so glad you get to spend all this time with Julia. How special, and I have no doubt she’s insanely adorable. Congrats on finishing the draft, too! Jone: The beach! A fire on the beach! S’mores! I’m excited for you … And I’ll share my news soon. (Not stressful, Little Willow. Promise.) No, I’m not pregnant. Heh. LW: Now I am craving some dark chocolate. Dark chocolate granola would do, too. What good movies did you see? Farida: I’m with Moira on the wonderfulness of kick #4. It should be a weekly assumed kick. Hear, hear to #7. Moira: I hear the audiobook is great, since Tina herself reads it. … Congrats on a quiet house, though I’m sure you miss your company. … Happy you’re here, you know. And now I wanna go see your Illustration Friday illustration. Jess: Saw your brother’s post. I LOVE The Squirrel’s Birthday. After I finished it, I thought, I wanna write a book THAT good. Toon made it look easy. Moira: Visited your blog. Sorry you had to go to a funeral recently. Hug. Jules, I know he did! I loved Toon’s book I want to get the companion book; I didn’t think about that when I was reading it, but yes it gave this air of effortlessness and wonderful freedom with words and was just wonderful! I love that quote from John’s book too, there are so many good ones in there! I’m excited to pick my favorites when I write up my guest review on it in the next few days. Margie, I definitely want to look at the poster I’ll have to look it up! 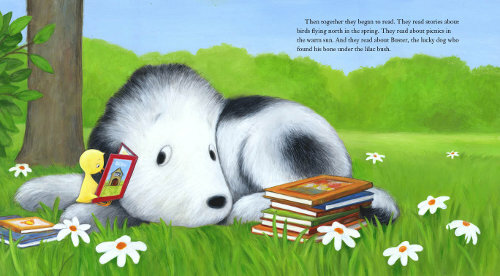 And I need to check out Nanny Piggins from the library again, I was supposed to read it with my brother a while ago and we never got to it, but it looked so good! Farida: Hope foam rolling helps you! I know someone who does that, and says it hurts her but it helps her. Moira, Jules: The dark chocolate granola I was crunching on = Cascadian Farms brand. Not a lot of chocolate in it, really, but that perhaps makes the chocolate bits even tastier. Moira: YAY TRELLIS! I love the look of a lovely trellis. Jules: Glad that it’s happy news. I watched most of the Barbara Stanwyck marathon on TCM a few days ago, and I’ve been checking out some independent films on the Sundance Channel. The best thing I’ve seen lately isn’t a film, but rather, a television show: Leverage, which I’ve been watching since its premiere, just began airing its fifth season. Sunday nights at 8 PM PST/EST 7 Central on TNT, people. It’s awesome. 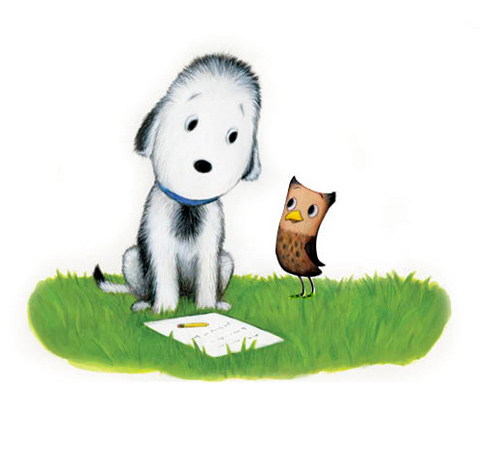 Oh, and Jules I found the illustrator for that image I sent you on Twitter! Months ago I luckily had typed up all the ideas I had for possible thesis projects, when I was still doing art history as my major, and one of my ideas was to write about art, illusions, and dreams in the works of Rene Magritte, Piero Fornasetti and Quint Buchholz…and that’s his name Quint Buchholz!! He’s a german artist/illustrator/author… I think I’ll have to make a post soon on him and the others I mentioned and possibly add in Morris Lessmore as well! 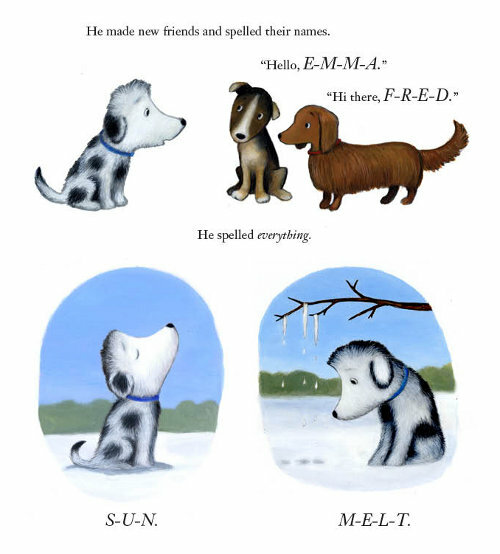 what an ADORABLE book – I haven’t seen the first one, which I can’t believe. I’m smitten. Thank you so much. 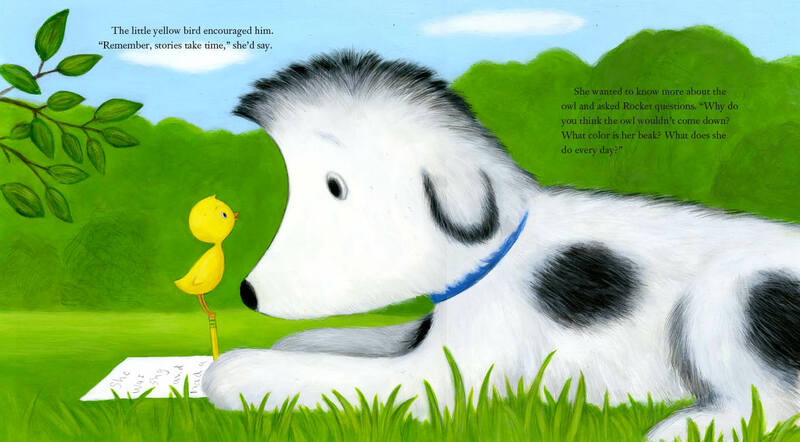 I think my little will love this story. I missed when it is coming out, but I’ll be watching like a hawk for it. Holy Moly – everyone has great Kicks and such friendly, encouraging comments! What a group – what a week! I’m so happy to read every one. 3. discovered some of the charms of ‘Fancy Nancy’ after reading the book for the first time, and then wrote a humble pie apology post on my blog for having written a slightly disparaging comment about ‘Fancy Nancy’ a few weeks ago with out every having read the book. Good lessons! Jules – I know you’ll cringe when you read this. 6. almost done with the giant tome I’m reading to review – I should be reading it now. Yes, I’m procrastinating! Happy Sunday Imps! Kicking late this week, and been a few weeks for me too…I’ve missed everyone! Love Rocket! Both of these books are now on my list for me and several kids I know too. Jules – that Hiphopoppatamus was awesome! I loved Bossypants, it made me laugh out loud in parts. Stacy – the family birthday celebration and vacation from tv sound great! Jess – that 45 page list sounds amazing! Margie – hooray for rescuing the toad! Elaine – congrats on finishing the manuscript, and enjoying your granddaughter! Jone – jealous you are at the beach but so glad you are enjoying it! LW – hope rehearsals are going well. and fresh fruit = yum! I bought a half flat this week at a farmers market and have enjoyed it so much. Farida – Orcas Island in the summer – what fun! And a Pimm’s Cup is so perfect for summer. 1) After 10 months in my house I finally picked a color scheme. 2) Painted my bedroom last weekend. 3) Painted the living room and dining room this weekend – with good friends to help out, chat and share cocktails with while painting. 4) Super happy with the results, and next up is the guest bedroom. 5) Made syrup today from fresh raspberries and blackberries to use in wine spritzers for a dinner later this week. 6) Finished Days of Little Texas by R.A. Nelson – really really liked it. 7) Have a couple of days off starting tomorrow, and next up is going to a Timbers game with friends. Jess: Companion book? Must find! Also, good sleuthing work with that image. 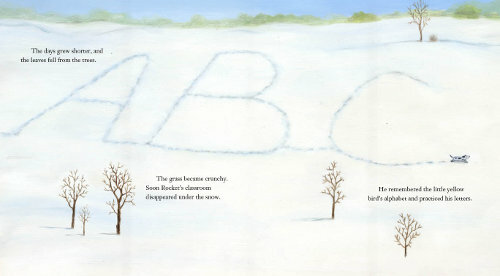 Speaking of Morris Lessmore, maybe that can be the art I feature next Sunday here at 7-Imp Camp. LW: I gotta add Leverage to the ‘ol queueueuee, since you consistently recommend it. Allison: Your second kick sounds fun. I wish I could sit in on that workshop. And I did see that post the other day after you first posted it. I’m sure we’ve ALL been guilty of this! Rachel, what’s your color scheme? Inquiring minds wanna know. I think painting and cocktails sounds perfect. Enjoy your days off! Jess: Thanks. I will hunt them down! I agree with your observation that there are a million ways Tad Hill could have failed in writing this book. When I read about this book, I did not expect it to be successful. I may not have even given it a shot if my parents hadn’t given it to my daughter as a present. That said, I think Tad did a fantastic job of creating a story that is very readable and gets kids who are just starting to sound out words excited about their new skills. love Tad Hills work and looking forward to this new book. He gets such great emotion from such simple expression. Thanks as usual for my (here lately mid-week) inspiration. As usual its great reading everyone’s kicks and getting ideas for art/music/books. Running out to get kids so no time for kicks this minute. Glad Knoxville went well and enjoy Bossypants… wait til you get to Prayer for My Daughter.. it’s hilarious!